Born to parents with no musical background, Finghin’s elder sister Mary began to teach him the piano when she was 13 and he was three. 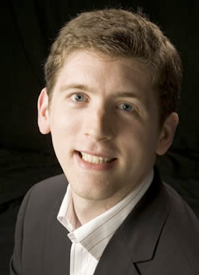 In November 2000 Finghin made his American debut with the Houston Symphony Orchestra conducted by Christoph Eschenbach. In the 2002 season, he returned to the Houston Symphony to perform with their music director Hans Graf and also played with the San Antonio Symphony Orchestra. At 24, Finghin Collins has the world at his fingertips. Since winning the prestigious Clara Haskil competition two years ago, life has continued to shine for John O’Conor’s protégé. “If I had been told at 16 that I would play with the Chicago Symphony orchestra by 24 I simply wouldn’t have believed it”, says Finghin, who was the first ever Irish pianist to win an international award without first going abroad to train.